As we all are marching into the New Year, I would like to post about my plans to become a Data Scientist, my 2014 resolution at Professional front. The term Data Science was first introduced to me a year ago same time. Since then I have started researching and gathering necessary information and decided to become Data Scientist. After one year I just wanted to look back myself to understand where I stand now & still what needs to be done. Automobile companies are installing special devices which continuously feed data about the nature of driving, the roads being taken, places being visited etc. to the Insurance companies who by analyzing this information can customize the insurance plans for its customers. Another possible use case, making use of the data we store on social media, we can develop products which can understand us and sometimes guide us. Like, based on people’s posts on social media, with location, time, road you are travelling & LIVE Traffic feeds, we can develop an app which could suggest us which road to take to our destination taking. Data Scientist termed as the Sexiest Job of the 21st Century and is the most sought after & well paid job all over the Industry. The role of the Data Scientist is to Make Sense out of the tons of Data being generated every day, build products which can redefine more statistically/ scientifically the way the current businesses is going. The best part of this Job Is, a Data Scientist can fit into any industry where ever data exists. What it needs to become a Data Scientist? "Web is my University, Time is the only Investment"
Going back to where I have started my journey, after my initial research with my folks and over internet, I started taking up Machine Learning course from Coursera.org, an online offering from Stanford University, definitely a recommended Starting Point for anyone who wants to be a Data Scientist. My First analytics assignment on Predictive modelling gave me a lot of learnings, the need to brush up my Mathematics basics, Stats fundamentals, data mining techniques, Visualization Techniques. 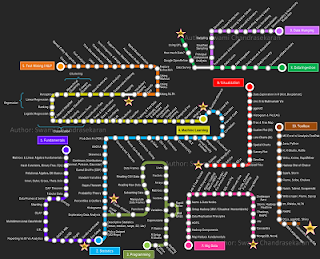 The image, below which I have got over internet, is a simplified road map for a Data Scientist, which has become my Target over the next few months combined with Hands-on. After completing the required courses mentioned above, I got an opportunity to play around with Data using Text Mining, Classification techniques, Predictive modelling techniques both from within my Organization & outside (KAGGLE.COM). It would be incomplete, if I don’t mention KAGGLE, the website where I found the much needed hands-on experience. KAGGLE is an online Open competition forum, where you can find Data Science Use cases posted by big Companies. Advantage of working on this site is not only you can get hands-on experience but also you increase your Network with similar competent techies. Apart from KAGGLE, I have made use of LINKEDIN data science/data Analysis groups where I could get suggestions and answers to almost every question of mine by the Experts of this field. “Learn a bit of Java, Learn a bit of Linux – shell scripting, Learn Hadoop” – an advice from my friend. After completing few POCs and began working with real time projects I have soon realized the need to handle huge amounts of data and need to learn BIG DATA. 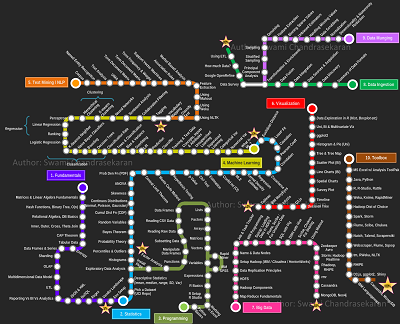 In my personal opinion, a Data Scientist should have a very strong knowledge in Big Data-Hadoop. For this, I planned to choose the road path of learning Big Data Hadoop concepts, Linux Shell scripting, MongoDB for data storage in the next 3 months. That is me folks, after one year; long way to go through before becoming a Data Scientist. But still would love to hear someone calling me a Data Scientist. Over the last one year, I have spent most of my time in learning new concepts & technologies. I am eager to see my theory shaping into work. In my next blog post I will explain the tools, concepts, technologies, online forums available on internet.